You may have noticed a drop in the number of restaurants posts I’m writing. From a bit of a deluge in October and November last year to just three so far in 2011. Partly this is down to eating out less as I try to breathe life back into my battered body and bank account. But it’s not just that. I’m suffering from restaurant fatigue. This is more in the bloggy rather than the eating sense, but not totally. Making mental notes about the food, thinking about the best camera shot and worse of all, choosing dishes to fit what I want to write. It’s all got in way of simply enjoying the food. Okay, so maybe it hasn’t quite gone that far, but I could see it heading that way if I kept up what was becoming a bit of a remorseless cycle of book-eat-write-post. So from here on in, I’m only going to blog restaurants when I really feel like it, when I’ve been somewhere extraordinary, or just plain different. When I have found something inspiring and interesting. Something I want to write about. And you know what? I really love food, finding out more about it, cooking it, looking for ingredients and combinations that bring taste buds alive and leave you lusting after more. It’s such a sensual thing, whether it’s simple porridge or something infinitely more complex with layers of taste, texture and aromas. So expect more cooking and recipes, less restaurants (although there’ll still be some). And in that vein, here’s a simple supper dish that I threw together last night. It’s the sort of thing best made with uber-fresh vegetables because there isn’t anything to hide behind. Radishes provided colour and crunch, a gorgeous goats cheese added pungency, a creamy smooth texture and sharp flavour. The lemon zest brought zingy excitement and the oil pulled everything smoothly together. Simple, tasty and very quick to prepare. The key to this, as with all salads is to get an attractive combination of colours, tastes and textures that will both excite and refresh. So make sure you get fresh, good quality ingredients. It would go very well with just some good bread and a glass of light red or rose. 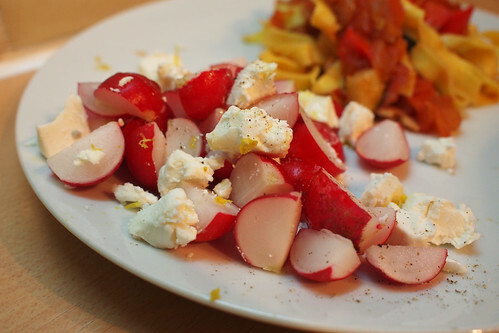 Wash and quarter the radishes, crumble the goats cheese into lumps about the same size as the radish quarters. Combine, scatter over the lemon zest, then pour over the lemon juice, a little olive oil and a grind or two of black pepper. Well done and fantastic looking salad. I definitely am in a similar boat on this one, although my restaurant eating has gotten in the way of cooking and blogging. Eating out in Hong Kong is so easy and when life gets busy, you really have to make an effort. I need to follow your lead and get my body and mind back in the kitchen. This looks lovely! Any tips for softening / sweetening the sometimes bitterness of the radishes? @Jen – Thanks! I really need to do more, and will as the weather improves. I reckon salads are the best chance to really play with textures and colours as well as taste. You wrote about that a while ago and it really sunk home and inspired me somewhat. @Going with my gut – and maybe even Hallelujah AS for the softening, i think that the lemon and oil tend to mitigate the bitterness, and the sharp cheese balances it a wee bit. But then, I do like a bit of bitter crunch. You could try making a sweet-sharp Thai-style dressing with sugar, sweet chilli and rice vinegar? I know exactly what you mean fella. I hate it when eating out feels like a chore. Keep up with the recipes though, always lovely! @Paul – it was more that I was focusing on the blogging over the eating/ordering, definitely the wrong way round! No fear re the recipes, i love them. I feel I am in the same boat, but my lack of recent restaurant reviews all boils down to having not a lot of money. Which I cannot see changing in the near future. I fell out of love of cooking a while ago and I am trying to get it back. I think we might both be going through a mid-blog crisis! As you know from our chat at Ba Shan, I’ve come to a very similar conclusion in terms of restaurant reviews. I don’t know about you but I never intended writing so many reviews in so much detail when I first started blogging, so in a way I’m starting over. Anyway, you’ll be OK, you have loads of recipes to fall back on. Spare a thought for me – just how the hell am I going to fill the blog void?! @Mzungu – There is also an element of trying to rest my battered bank account. Saying that, bar the Eastside Inn, my meals of 2011 were all mid-range. I find I prefer a less formal experience, both in terms of service and food. Glad to hear the love of cooking is returning! @Mr Noodles – i think you may be right. I am trying to balance things a bit better. This was always meant to be about food in all it’s forms, but with a focus on cooking. I am very confident that you’ll come up with something to fill the void – philosophical noodlings on noodles maybe (sorry) ? Or travel, you certainly cover the globe.